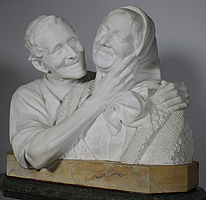 FERDINANDO VICHI (Italian (1875-1945) A Very Finely Carved Italian 19th-20th Century White Carrara Marble Romantic Style Life-Size Bust Group Titled "Rimembranze" (Remembrance) depicting a charming embracing elderly couple, the man tenderly touching the lady's chin and face, both with a loving and mesmerized look on their faces. 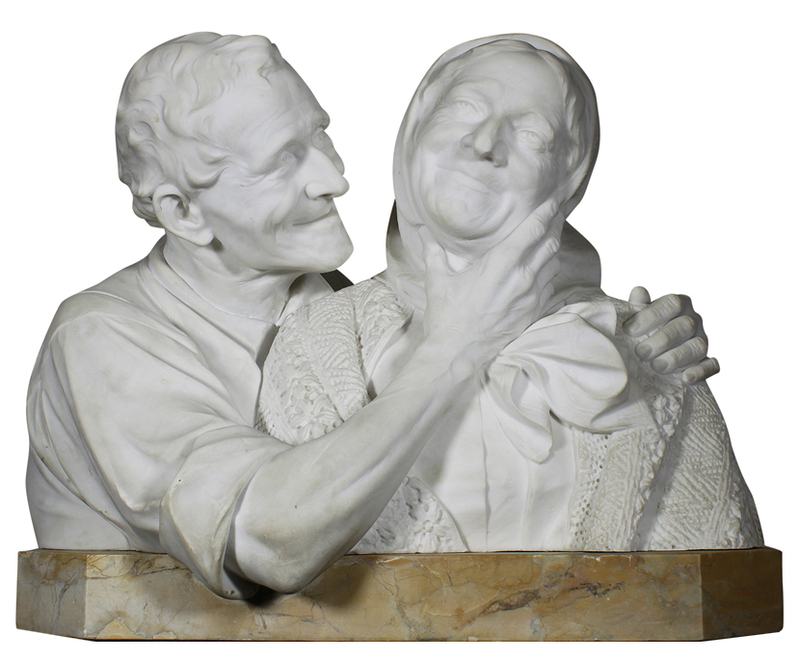 Vichi's talented depiction and fine detailed carving of the couple's wrinkles, veins, muscles, clothing and expressions make this sculpture one of his finest and most detailed works. On a Yellow Sienna marble plinth and raised on it's original swiveling Verde-Green Alps marble pedestal. Signed: F. Vichi, Florence ~ Made in Italy. Circa: Florence, 1900. 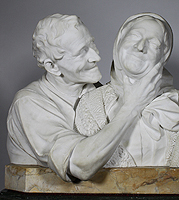 Ferdinando Vichi (Italian (1875-1945) was part of the talented band of Tuscan sculptors from the Florentine School associated with the Bazzanti Gallery in Florence, Italy. His compositions are varied in subject matter, ranging from Romantic busts to orientalist themes and Renaissance-inspired models. 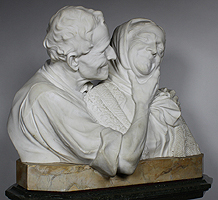 Like many other late nineteenth-century sculptors, Vichi often took inspiration from Romantic and Tender subjects, as with this charming and beautifully detailed carved marble groups of an elderly man flirting and showing his love for his wife. In this work, one can appreciate Vichi's well known imaginative idealization of sensuality and particularly in his mastery of facial expressions and a sly smiles. Though a somewhat unusual subject, this work in white marble demonstrates a high technical virtuosity, particularly in his mastery of facial expression, detailed muscles and veins. 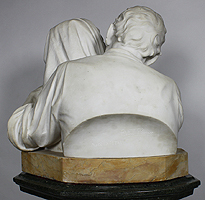 In 1898 Vichi contributed to the memorial erected in the cathedral of Santa Croce to honor the composer Gioacchino Rossini. 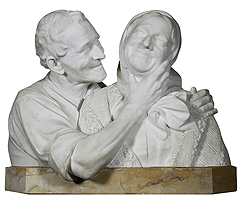 FERDINANDO VICHI (Italian (1875-1945) A Very Finely Carved Italian 19th-20th Century White Carrara Marble Romantic Style Life-Size Bust Group Titled "Rimembranze" (Remembrance) depicting a charming embracing elderly couple, the man tenderly touching the lady's chin and face, both with a loving and mesmerized look on their faces. 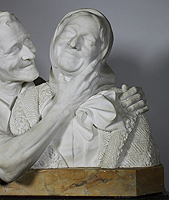 Vichi's talented depiction and fine detailed carving of the couple's wrinkles, veins, muscles, clothing and expressions make this sculpture one of his finest and most detailed works. 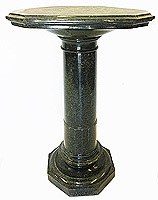 On a Yellow Sienna marble plinth and raised on it's original swiveling Verde-Green Alps marble pedestal. Signed: F. Vichi, Florence ~ Made in Italy. Circa: Florence, 1900. 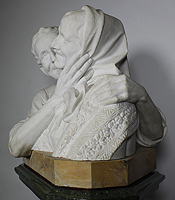 Ferdinando Vichi (Italian (1875-1945) was part of the talented band of Tuscan sculptors from the Florentine School associated with the Bazzanti Gallery in Florence, Italy. His compositions are varied in subject matter, ranging from Romantic busts to orientalist themes and Renaissance-inspired models. 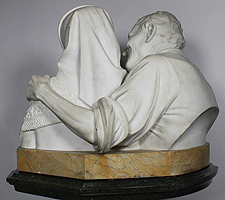 Like many other late nineteenth-century sculptors, Vichi often took inspiration from Romantic and Tender subjects, as with this charming and beautifully detailed carved marble groups of an elderly man flirting and showing his love for his wife. In this work, one can appreciate Vichi's well known imaginative idealization of sensuality and particularly in his mastery of facial expressions and a sly smiles. 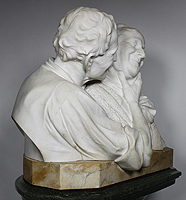 Though a somewhat unusual subject, this work in white marble demonstrates a high technical virtuosity, particularly in his mastery of facial expression, detailed muscles and veins. In 1898 Vichi contributed to the memorial erected in the cathedral of Santa Croce to honor the composer Gioacchino Rossini.